I'd like to get some opinions on makes/models for a new F&T trap. This is for a two pipe steam system running at 1-2 psi. There are crossover traps in place and working well. The mains all connect directly to the wet returns without vents. There is currently only one F&T trap at the end of the dry return next to the boiler. There is no condensate pump. The current F&T trap is a Barnes & Jones No 397 (pic). I am sure it is very old and probably not working well. However, the system does maintain a good vacuum between cycles, and so I'd like the replacement trap to also have an integrated check valve to allow for a vacuum as well as the elimination of air. I have calculated the volume of steam mains at about 54 cubic feet. The house EDR is about 2,270. 2270 EDR in a house? That place must be huge! 12,000 to 15,000 Sq. Ft. ? It is a very large house, with a large heating bill. Three floors, about 13,000 sq feet. 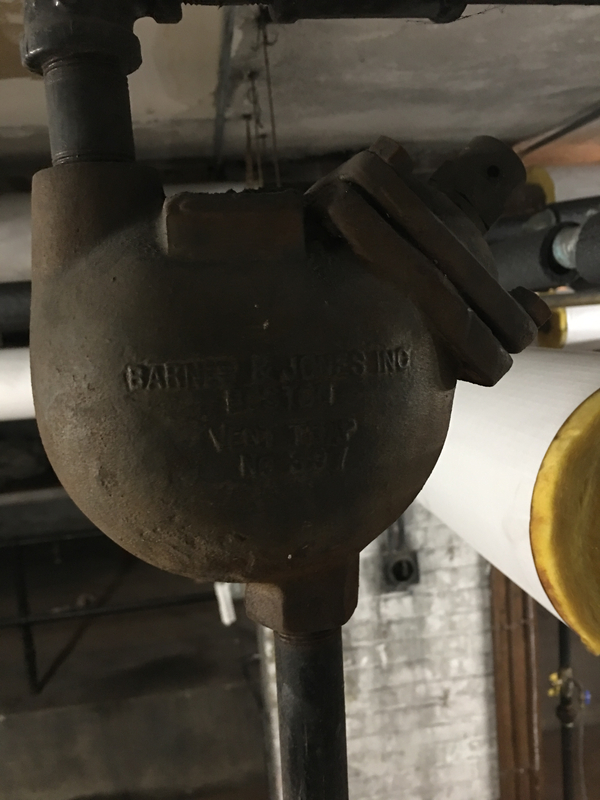 I suspect we are looking at B & Js version of a boiler return trap or alternating receiver Can you step back and take some additional pictures?? yeah, i agree with EBEBRATT-Ed..something is wrong with the description. 2 psi twp pipe would need a boiler return trap or all the water would fill the dry returns. And I agree with both @gerry gill and @EBEBRATT-Ed . Something is amiss here. The presence of crossover traps suggests to me very strongly indeed that this was intended as a vapour system. In which case, you should begin by revising things so it will operate as one: add a vapourstat to the pressure control circuit, and set it at no more than 8 ounces per square inch cutout to start with (put a low pressure gauge on the same pigtail to verify its settings). Are you quite sure that it is piped as the diagram you furnished shows? That diagram does not have an F&T in it! The picture you provide does look like an F&T, in which case it's not the correct part. Note that the part in the diagram has two connections at the top -- one to the steam main, and one to the air eliminator. Then. You do not want an F&T. if the pressure is low enough, and kept that low, you may find you can get away without any trap there at all. If that doesn't work, then you do need an alternating receiver on there -- or a Hoffman Differential Loop. Note also that in this type of system, all the dry returns connect together at the boiler, and are vented there -- nowhere, repeat nowhere, else in the system. I think that's an "air trap" "float trap/air eliminator" or similar. It functions as the only air vent on that system. When I displayed the pic at full size, it looked like there was a threaded opening in the top. Can you verify this? Also, can you step back from this device and let us see how it is piped into the system? That's the old B&J condensator it's a boiler return trap as others have said. Not an F&T trap. Thanks everyone for your input, it's a great learning experience. I will try and add clarity as best I can as an amateur and steam novice. 2. The system currently is controlled by a Pressuretrol cutting in at 0.5 psi with a differential of 1 psi. According to the 0-30 psi gauge, the cut out is occurring closer to 3 psi. 3. The piping does follow the diagram schematic. 4. The system is working reasonably well, after I lowered the pressure from 5 psi and replaced a lot of radiator traps cages, and the crossover traps. Within the next two weeks I will be adding a Vaportstat to the system with a low pressure gauge and dialing the pressure down per Jamie's advice above. I assumed (incorrectly) that the B&J 397 was a kind of F&T trap, thank you Sailah for definitively providing that it is a boiler return trap. I hear nothing from the B&J 397 trap during operation. I can feel no air being vented from the trap when the boiler fires up. 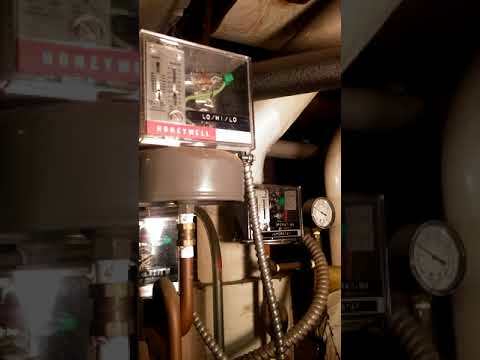 Condensate is being returned to the boiler, and the system does hold a vacuum well. 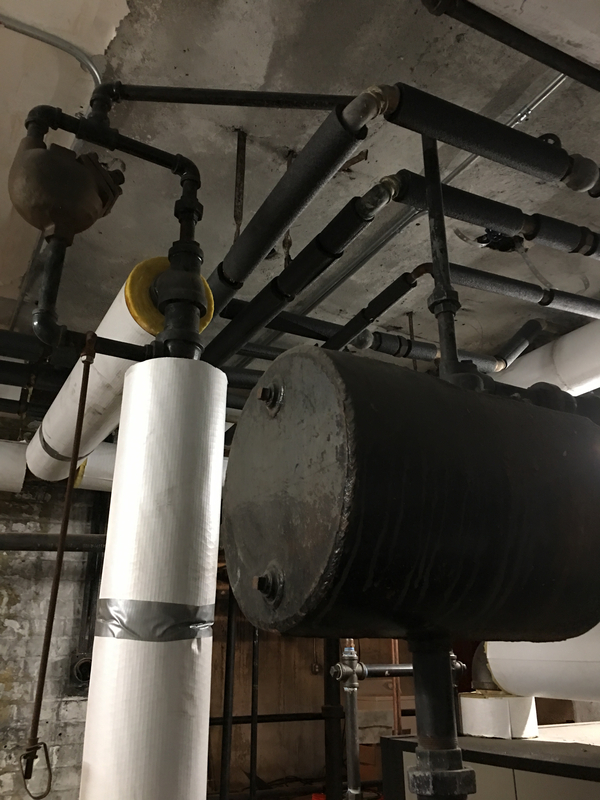 However, the boiler builds pressure fairly quickly (it is over sized though) and upper floor radiators can take a while to warm up ( more than 30 minutes in the worst spots). 1. For the uninitiated, what's the difference between an F&T trap and a boiler return trap? 2. 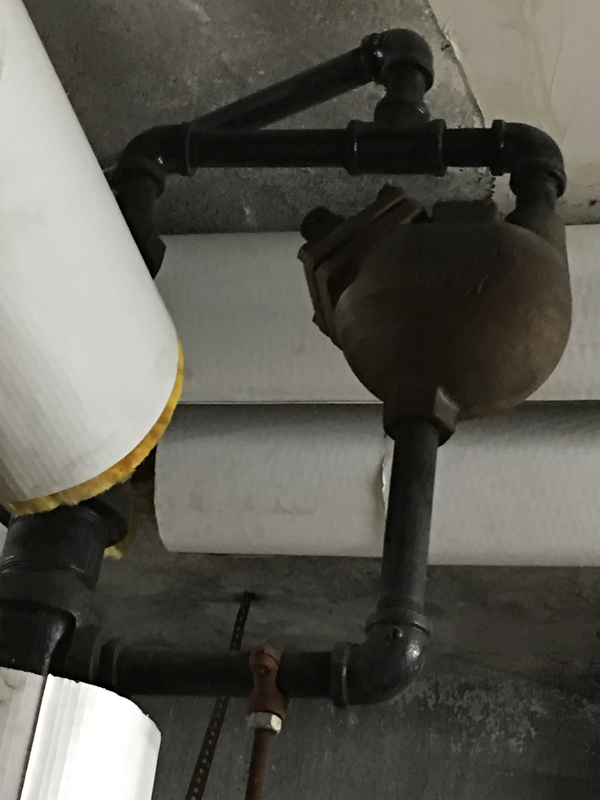 How can you tell that the boiler return trap is working properly? 3. If the trap is not working properly, what are the recommendations to replace it? No water hammer, return main cooler than supply main, run the boiler on low pressure, stable water line. I would try and figure out why the third floor is slow to heat. I guess the difference in traps is a F &T shuts when steam hits it and lets water and air through. 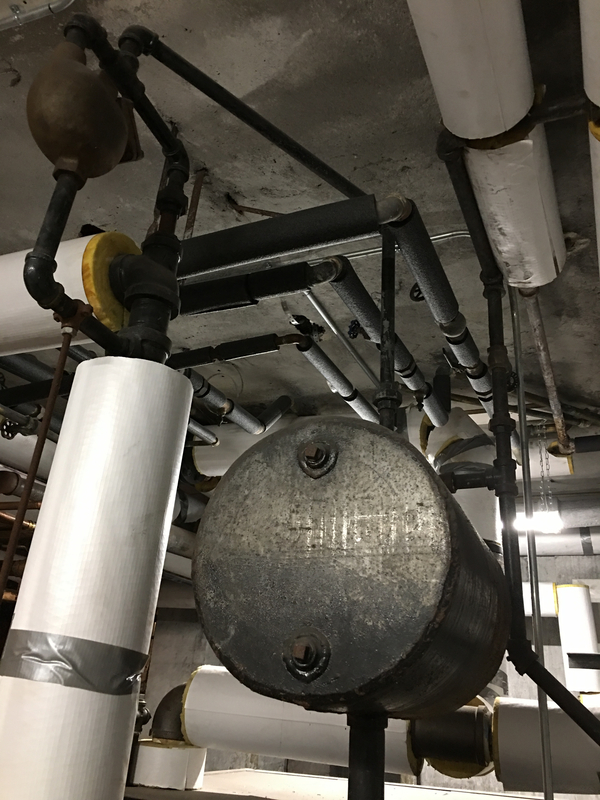 A boiler return trap uses steam from the boiler to help push the condensate back to the boiler. It's actually a steam power condensate pump. If... your dry returns are more than about 15 inches above the boiler water line -- which your picture suggests -- and you can get a vapoustat on that and a low pressure gauge, and keep the thing running at less than 8 ounces per square inch, you may just be able to get away with no return trap at all. 24 inches would be that much better -- that would give you a tad less than 1 psi. You do need a good big vent or vents there. I'd suggest a couple of Gorton #2s, as you need them to close if water hits them. Boiler looks like a 588, damn that’s big, for a house anyway. A 488 would’ve been closer matched to your EDR though. A 6” or 8” header would’ve really been nice on that boiler too. I have about 47 inches from the boiler water line to the dry return, so about 1.7 psi max pressure. i will start off a 8 oz. and go from there. So I will install the Vaportstat and dial down the pressure. Then I can install some vents on the dry return to speed up the heating. Do the Goton #2s hold a vacuum? No -- the only vents I know of which hold a vacuum are Hoffman 76s., which are about half as fast (about the same as a Gorton #1). They are also pricey. Do you need to hold a vacuum? NO. The only vacuum vent on the market today is the Hoffman #76, which is way too small for your system. The current (original?) 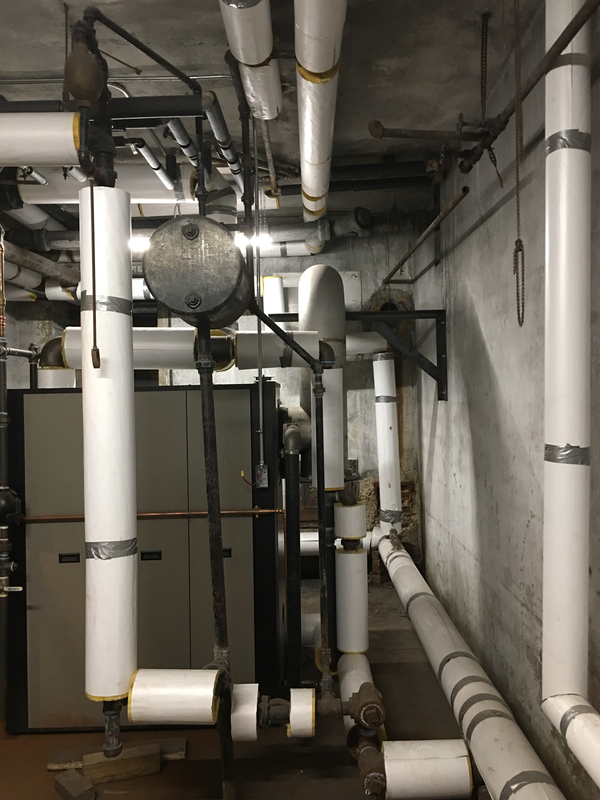 system runs at a vacuum between boiler cycles, and I have found the discussions (on this site) in favor of not allowing air back into the system between boiler cycles to be persuasive. However, I don't think that the vacuum aspect is as critical as the rapid venting of air, so if I have to choose between those two features I'd go with the Gorton #2s. Something that I have not tried though is to take apart the B&J 397 and clean it out. That's something I'd need to attempt in the spring since I am sure that the bolts etc will not shift willingly. In addition, there's no repair parts available. Since I'll be running at a controlled low pressure, I should not need the trap feature of the B&J 397, I just need to ensure that it can vent air rapidly. Perhaps a good cleaning will help with that. Is the air eliminator still in place and connected? There are some advantages to letting a steam system drop into a vacuum. However, in my humble opinion, the added complexity and cost are not worth it. If you can get the B&J 397 working again, and if the air eliminator is still attached and working, you won't need any more vents -- and the air eliminator had a check to allow the system to go into vacuum. If not, go with a nice pair of Gorton #2s and be happy. Jamie - I think you've summed it up nicely. I am going to follow your advice. You can always do a solenoid valve as a check valve/vent on or in front of it, and have it close once the system warms up. @PMJ has a vacuum 2 piper system ran off a PLC. You can then use any vent and have the valve close down as the air is exhausted from the system, allowing for a vacuum. The solenoid valve etc. is exactly the sort of complexity which I prefer to avoid -- but to each their own. @Jamie Hall if to preserve vacuum and self balancing it provides, simple solenoid on a timer or a sensor should not be too complicated. I agree in principle that simple is always better from stand point of servicing and potential breakdowns. However, if the op can do all this work himself, as he seems to be doing, I don't really see a down side. Best would be to make sure the air eliminate is working as originally installed and leave it as it was for past 100 years. As Ed said, why are you suspecting the B&J is not working? Just thought that I'd provide a quick update. I was able to open up the old B&J 397 trap. Someone had wrapped the brass ball in the air eliminator with teflon tape. Over many years the ball had glued in place, and thus the ONLY air eliminator in the entire system was eliminating no air (I suppose the air was therefore being eliminated from the radiator supply valves?). I was able to clean that ball up easily enough. The actual trap mechanism itself was rusty but sound. So now the B&J trap eliminates air from the dry return as it should and is still able to hold a good vacuum. I also installed a new vaportstat and low pressure gauge, keeping the pressuretrol as an additional safety control to the already in place high pressure limit safety switch. The pressuretrol was set a 0.5 psi cut-in, with a 1.5 psi cut out. The actual cut-in was close to 0.5 psi, but the actual cut out was closer to 3 psi as measured by the new low pressure gauge. This represents a 100% accuracy error on the pressuretrol, if the new low pressure gauge is to be believed. The vaporstat is now set to a cut out of about 12 oz. The cut in is at 4 oz but given the delay in firing the burner up, the actual pressure is close to 0 before the pressure starts to rise again. Not sure there's anything I can do about that. The result is that entire house, and all radiators, warms evenly. Today is it very cold (high about about 0F, low about -8F) and if anything it is a bit too warm in the house. Those radiators that used to hiss water and steam are now quiet. 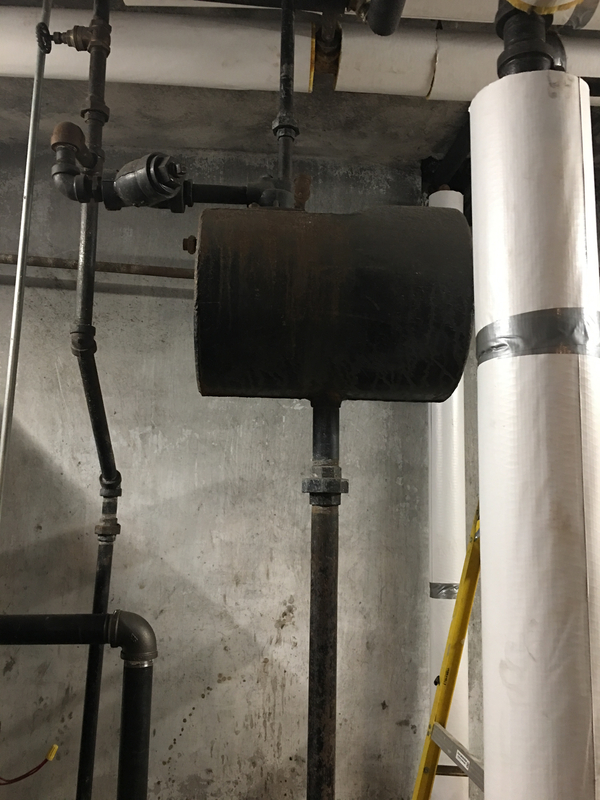 You can hear the B&J vent hissing air from the dry return on pressure. There is no sign of any steam escaping the B&J vent. The only downside I have experienced is more rapid cycling of the boiler. This was expected give the lower pressure setting and a significantly over sized boiler. I think that the rapid cycling has been somewhat mitigated by the significantly improved system venting. I still have a couple of thermostatic traps to change out, and the old radiator supply valves need to be addressed in the spring, but the system is drastically improved from last year when I bought the house and the heat basically did not work. The value of this site and the experts who provide advice to the inexperienced homeowners like me is incalculable. Thank you! Thank you for getting back to us -- and isn't it a joy when things begin to work the way they were meant to! Now that you're able to get rid of the air, you can probably down-fire that boiler to more closely match your radiation. What burner is on it? If that's the version that has an air damper operated by a crank-arm setup from the main gas valve actuator, it should be possible to convert it to lo-hi-lo operation. 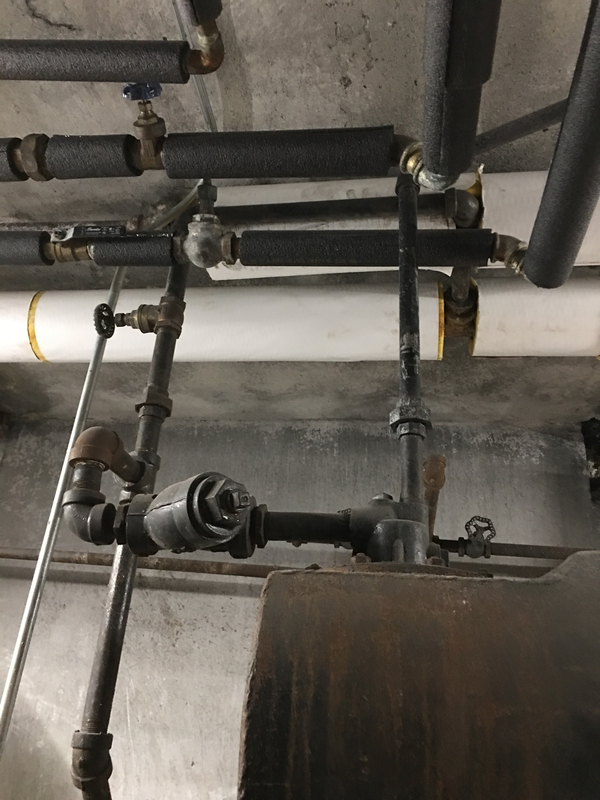 This way, a second Vaporstat would drop the firing rate as pressure starts to build, so the boiler would run at a lower input rather than shutting off and wasting heat during the required purge periods. The actuator on yours should have a model number V4055-something. correct? For your viewing enjoyment, a short video of lo-hi-lo in action. That's Calvert Court, which is featured in our Find a Contractor ad. Thanks everyone for the feedback. The burner is operated by a crank-arm configuration that opens something when the burner fires up. If the actuator is the big block looking thing that is inline with the gas connection, and to which the crank-arm is attached, then it is a Honeywell V0455A-1064. How involved is the conversion to lo-hi-lo? Does it add significant complexity that can later go wrong? How much does this alleviate the short cycling on a very over sized boiler? I think that this is something to attempt when the heating season comes to a close, and finding a qualified individual in Western MA might be a challenge. But definitely something to explore. Not something to do when it's 3 below out, however sunny it may be. Finding a qualified individual in western MA, though, is easy. Try Charles Garrity ( @Charlie from wmass ). You need to change the actuator to a V4062A- something. Call PowerFlame tech support, give them the model, serial and invoice numbers off the burner, tell them you want to switch it to lo-hi-lo and they will tell you what to use. That's what we did at Calvert Court. Thanks all, I will pursue this in the spring. I'll get in touch with powerflame to get the right parts. Charlie ... I will be calling you in the April/May time frame to see if this conversion is something you could accommodate.